Riskalyze 101: What is the 95% Probability Range? Want to know what makes Riskalyze tick? Today, we’ll discuss the way we measure client expectations—the 95% Probability Range. The 95% Probability Range is the cornerstone of setting client expectations with Riskalyze. It is the range of possible gains or losses a portfolio might experience over a six-month period. We've found that investors make better decisions when they understand what is normal for their portfolio, and our advisors use this data to keep their clients from making short-term decisions that kill long-term goals. Together with the Risk Number, the 95% Probability Range helps advisors focus the conversation on risk. This approach, also known as the Third Wave of Advice, embraces the concept that the short term matters. We’ve focused on a six-month timeframe because we believe that the industry standard of one year is simply too long for investors to “hang in there” during volatile times. If an advisor tells a client that their portfolio could gain 8% in the next year, the client will fixate on that number. If six months go by and their portfolio is only up 1%, they might start to wonder why it’s not performing as well as it ought to be (again, the only figure they know is 8%). Giving clients a range of reasonable expectations, rather than focusing on a narrow pinpoint, will protect them from both the fear of loss and the disappointment of less-than-stellar gains in the short term. This is what makes the 95% Probability Range so effective in setting expectations. The Six-Month 95% Probability Range is calculated from the standard deviation of the portfolio (via covariance matrix). The 5% left over is a statistical standard of downside risk that can’t be quantified (Black Swans, unforeseeable market events), and it represents a “devastating loss” for the client. After thorough testing in different market environments, less than 1% of portfolios have actually dipped into that 5% devastation range. With the 95% Probability Range, advisors can use simple terms to set client expectations for upside and downside alike. It makes behavioral coaching easy for advisors as they guide their clients through one short-term decision at a time. 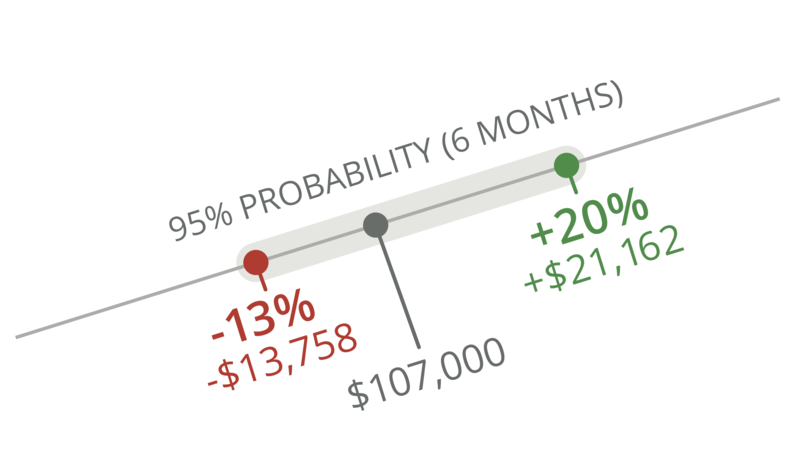 Riskalyze 101: What is Prospect Theory? Riskalyze 101: What is the Risk Number?